LOS ANGELES: New videogames mixing music with real-world action promise to get players off the couch, turning basketball dribblers into "true ballers" and helping new moms tighten their tummies. "NBA Baller Beats" laid claim to being the first videogame to incorporate basketballs into the action, challenging players to dribble in time with high-energy music in order to score points. The videogame taps into movement-sensing abilities of Kinect accessories for Xbox 360 controllers to challenge players to bounce balls in synch with on-screen cues and even do stunts like passing behind backs or between legs. 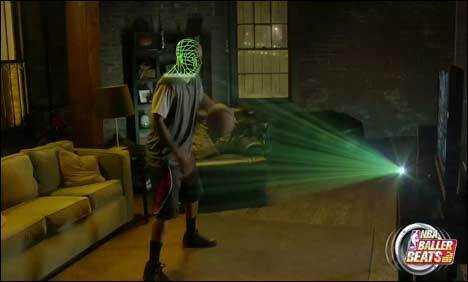 "Kinect knows everything you are doing so you can't fake it out," a spokesman for Majesco Entertainment said while demonstrating 'Baller Beats' at the E3 videogame industry extravaganza in Los Angeles on Wednesday. Copies of the game will be bundled with basketballs when they are released in September at a price of $60 each, according to Majesco. "Even though the game comes with a full-size basketball you can use any rubber ball, even a swimming pool ball," Majesco's Liz Buckley told. "That may be a little less intimidating for moms in the living room." The ball cannot be black because it would be too difficult to track properly, according to Buckley. Majesco also showed off a "Zumba Fitness Core" videogame that combined the Columbian dance exercise craze with Kinect for Xbox. "Core" will be released later this year as a new installment in a franchise that has sold more than seven million videogames since it was launched in November 2010. "It's a dance fitness party," Buckley said. "Exercise in disguise." "Core" features overall body workout routines with a special focus on chiseling abdominal muscles and firming sides. A Majesco survey of 28,000 women revealed that 61 percent wanted to get their tummies in better shape, according to Buckley. "Especially moms," she said. "You have kids and then you want your body back." Styles of dance featured in the new version of the game include African, jive, disco, and ballet. "Kinect is the most natural way to experience Zumba," Buckley said. "It is hands-free tracking, and if you go to Zumba in a gym it is all about using your body." About 12 million people worldwide take Zumba classes, according to Majesco, which took advantage of Xbox online capabilities to let "Core" players find real-world sessions close to home and stream related news to consoles.